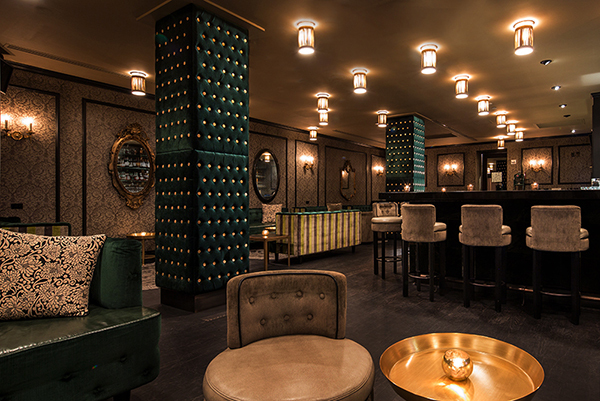 The bar’s furnishings and subtle design details are all one of a kind. Handpicked lamps, created by the self-proclaimed Steampunk Illusionist Terry Peikin, are made out of brass and copper with vintage pressure gauges, Edison bulbs and perforated diffusers and are situated throughout the space. Guests can enjoy their drinks while lounging on plush, velvet sofas and chairs, or at one of the barstools that align the large wrap around marble bar. Hidden in the back corner of the intimate, dim-lit lounge stands an unsuspecting DJ booth. © 2016 STUDIO GAIA INC. ALL RIGHTS RESERVED.